I woke up ungodly early on Monday. Drove to the rental car drop lot. Took the shuttle to the terminal. The first flight was fine. The crummy weather moved out quickly, so the morning flights were not affected. As we landed I was startled by a series of notification texts from the airline telling me that my next flight was delayed. By a LOT. Like, six hours. Even before the plane got to the terminal I started frantically looking up flights. I've often wondered why I make myself get up at the crack of dawn for these early flights. Well, today I had my answer. An earlier flight means that if I get delayed, I'll have a better chance at booking another flight instead of having to camp at the airport overnight. Had I taken the later flight, I would have had to sleep at the airport. Gotta remember that. Anyway, I found another flight that was leaving at exactly the same time as my delayed flight was supposed to, and got on that. While waiting for the plane to arrive I had a nice bagel with lox and chatted with people on facebook. The second flight went smoothly, and before I knew it we were in Orlando! Jameson was at a gig, so I got an Uber home. Family visit, complete! I had a lot of energy for some reason, and before Jameson got home I unpacked, washed the shower curtain, dusted the living room, and vacuumed. I emailed my tax preparer with some new information. I ate dinner and wrote out plans for the week. Because even though I'm not working (or even because I'm not working) there are a LOT of errands to run! On Tuesday morning I had breakfast while Jameson graded his students. Around lunchtime I gave my trombone a bath, ate something, and paid attention while Jameson showed me how to use the Blu Ray player and access the Overcooked game we're playing while he's gone. Then it was time to take him to the airport! We are taking turns traveling it seems lol. After seeing him off I drove to Trader Joe's for some of the things I just can't get anywhere else: Chomps jerky, non-sorbate prunes, and affordable almond butter. I also grabbed some coffee as it was on sale for $3(!) and a tub of Greek yogurt because why not, it's the same price at Publix. I ended up hitting two more grocery stores in a quest for cranberries and coarse sugar (I wanna make scones). Finally I came home and unpacked, then went straight to the gym. Next was a shower and dinner, and printing out a bunch of paperwork I'll need for the next few days. I also started prepping some activities for a project that my sister Kayle sent me on behalf of one of her students. Have you ever heard of the book Flat Stanley? It's a popular children's book in which a child is squashed flat through some mishap, and sends himself around the world in an envelope to meet new friends and see new places. Well, there is now a whole project built around the premise of this story! Many teachers and school programs use Flat Stanley as a sort of penpal learning program. 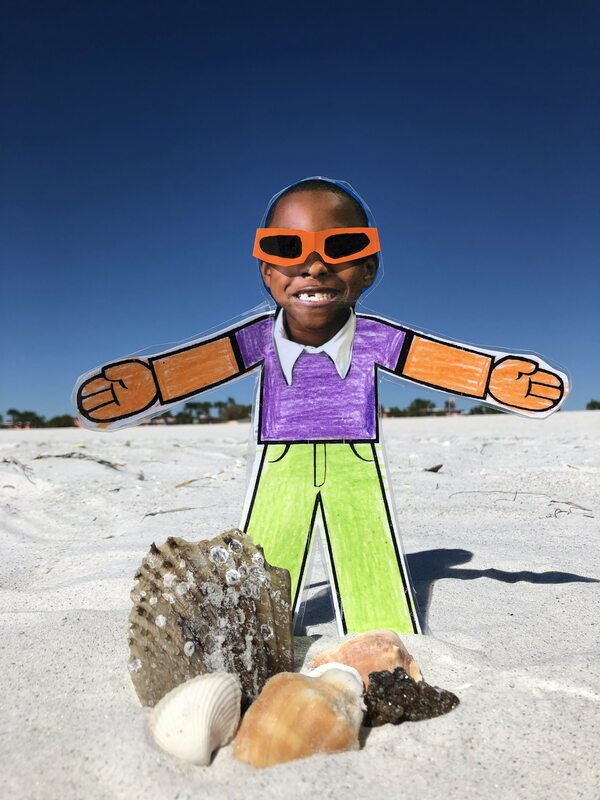 In this case, my sister's students each made a "Flat Stanley" version of themselves, and sent it to a friend or relative living in a different city, state, or country. Kayle has asked me to complete the project for this student...I forget why, but either he doesn't have extended family or they all live somewhere where he can't send his letter. Anyway, all of this means that I'll be showing "Flat Stanley" around Orlando for a few days! Actually, he showed up at a good time. On Wednesday I had to drive out to St. Petersburg for...stuff...that I am not disclosing yet...so I brought "Stanley" along! Once my business was finished I started looking for somewhere to grab lunch. To my surprise, there was a Food Network-featured restaurant not ten minutes down the road! 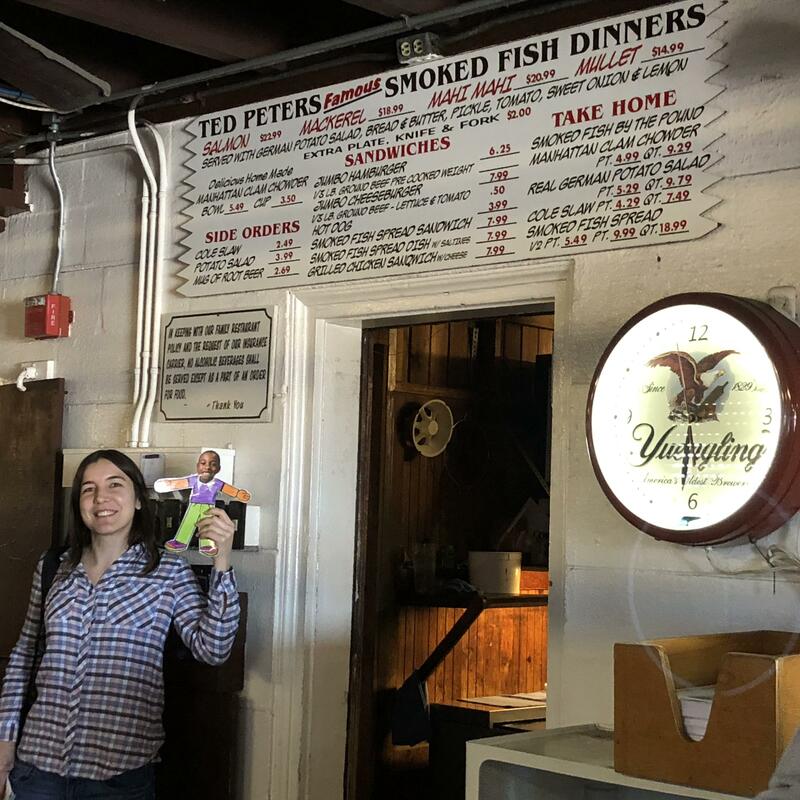 Ted Peters Famous Smoked Fish! I had to circle the tiny parking lot a bunch of times before someone gave me their spot. Because it was such a small joint I ordered to go at the bar. Several people noticed that I was holding a "Flat Stanley"...I was surprised that other people knew what it was! One gentleman offered to take a picture, and I agreed, knowing full well I wouldn't be sending this to a kid (beer clock!). So I guess y'all get to see it instead! I took the food to a nearby public beach. After all, if you're going to drive all the way to St. Pete, you may as well enjoy it! 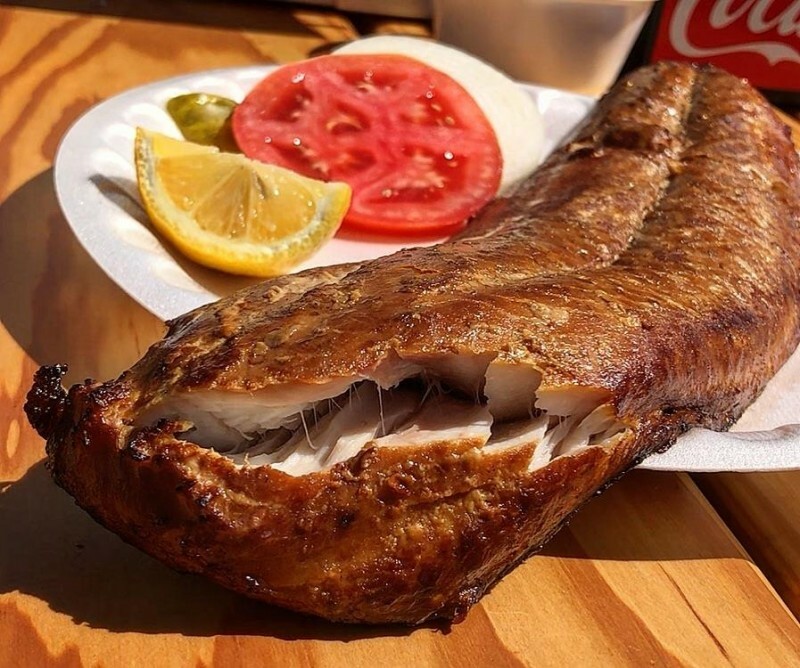 I had meant to order smoked mullet, but accidentally said "mackerel". Not that I'm disappointed. It was amazing!! And gigantic!! Who eats a whole one of these?! And it came with German potato salad and slaw and a piece of bread! I ate a filet-worth and took a bite of each of the sides, and did a little photoshoot with Stanley. 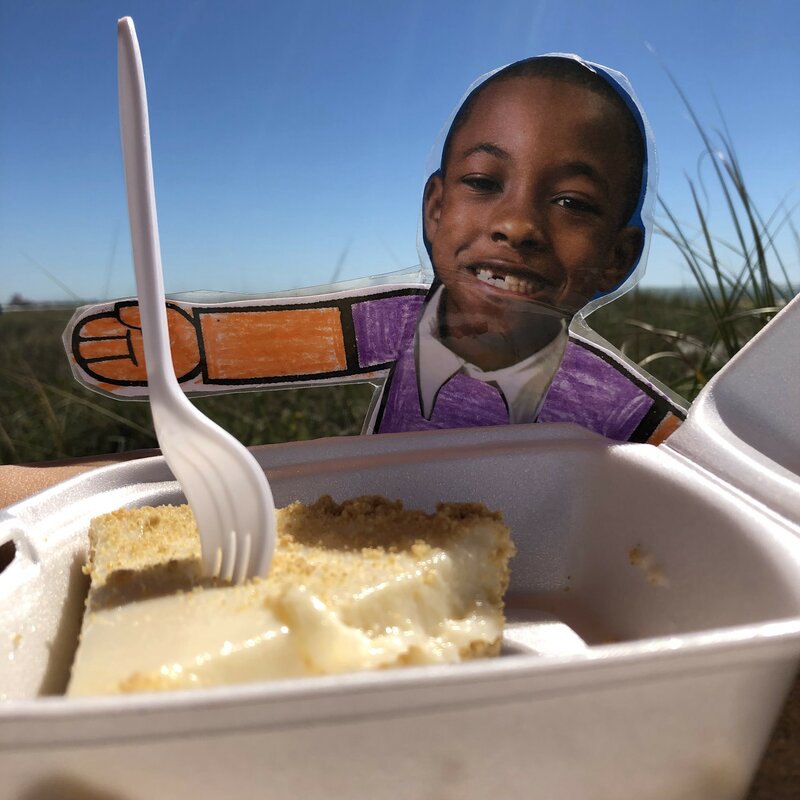 I had also gotten a piece of Key Lime pie solely because I thought Stanley should have a true Florida food. I think he appreciated that much more than the giant fish. Once we were done on the beach I started driving home, intent on beating the rush hour wave. I made it back to the apartment in a reasonable amount of time. After a light dinner I got to work assembling and editing the Flat Stanley photos, and writing a little journal entry to go along with them. I spent the rest of the evening relaxing. Because Thursday was an early day at the Toyota dealership. My car has needed new rotors/brake pads for a while now, among other things. I was surprised when the Toyota associate offered to give me a ride home even though I'm two miles outside their normal shuttle range. And I definitely said yes, there was a lot to do! I cleaned the bathrooms and the patio, ate lunch, and took a little break while waiting for the refrigerator repair technician to show up. Our fridge has been running strangely lately, and since I was suddenly faced with a day at home thanks to not having a car I figured why not get it checked out. Luckily the "repair" didn't take all that long...I'm still not 100% clear on what was wrong, but it seemed like the main issue was a lot of dense ice built up around the heating element. Jameson has thawed the fridge out at least twice since I've been here, but the repair tech said there was ice just densely packed around the coils from buildup over time. He managed to thaw the ice using hot water, then tested the heating element with a diagnostic device and told me it was working properly. Yay! A much easier repair than expected. And much faster than the car. I had dropped the car off at 7am, and didn't get it back until 5pm. To be fair, it had needed a lot of work. The cost made me flinch, but it's got to be done. I need this car to last. I ran a few errands, ate dinner, cleaned both bathrooms, and spent the rest of my evening relaxing. On Friday I went to the gym. The rest of the day was dedicated to scones! While on the cruise ship, I came to enjoy the daily Tea Time and the little scones that were served. 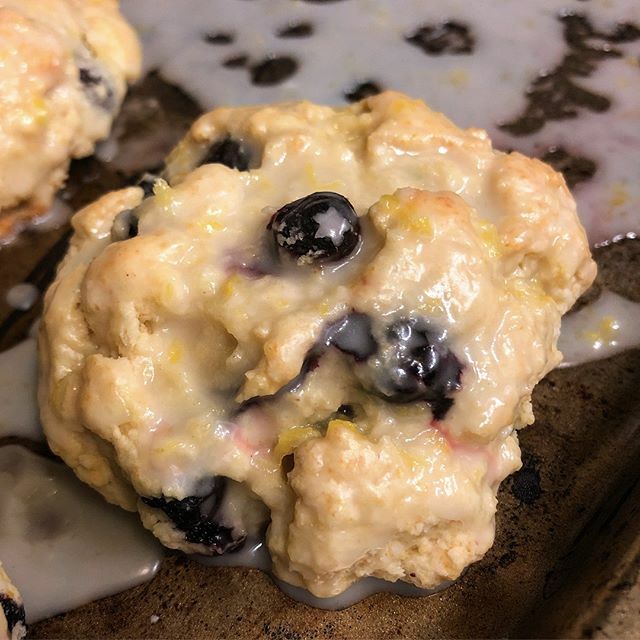 I thought it would be fun to try and make my own scones! My first batch, which were cranberry/orange, did not turn out great. They LOOK great, but they were very dense and kinda bland. I decided that I hadn't handled the dough properly, and also hadn't included enough orange zest or juice. The second batch was blueberry lemon. I changed how I managed the dough, and made sure to add plenty of lemon. These had a much better texture and flavor! They were supposed to have a lemon glaze as well, but that didn't turn out as planned :/ It was super wet, and nothing I did seemed to thicken it up. I probably didn't get enough of the water out from the lemon juice. Anyway, I got it as thick as I could and when the scones were cool I poured it on. It was still too thin, but hopefully they'll still taste all right tomorrow. I want to send some to my siblings, and maybe take a few to my aunt when I visit her next week. And of course I'm setting some aside for Jameson and me! The scones took up most of my day. Tomorrow I plan to make more, but it should go a lot faster now that I know what to do. 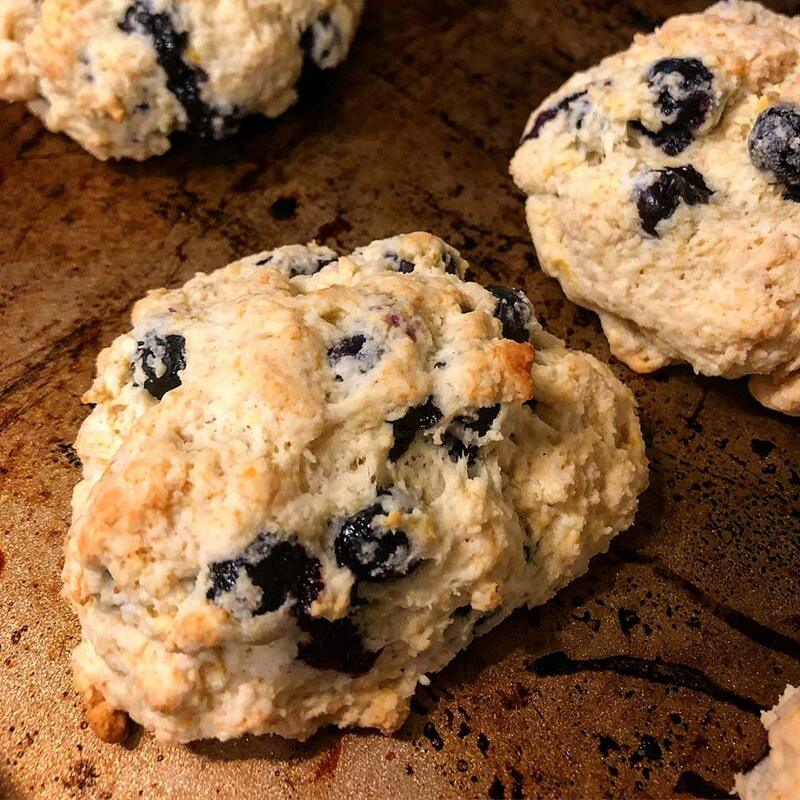 First thing in the morning, I made the scones. Figured get 'em over with. I changed a few things...first of all, no glaze, just coarse sugar. 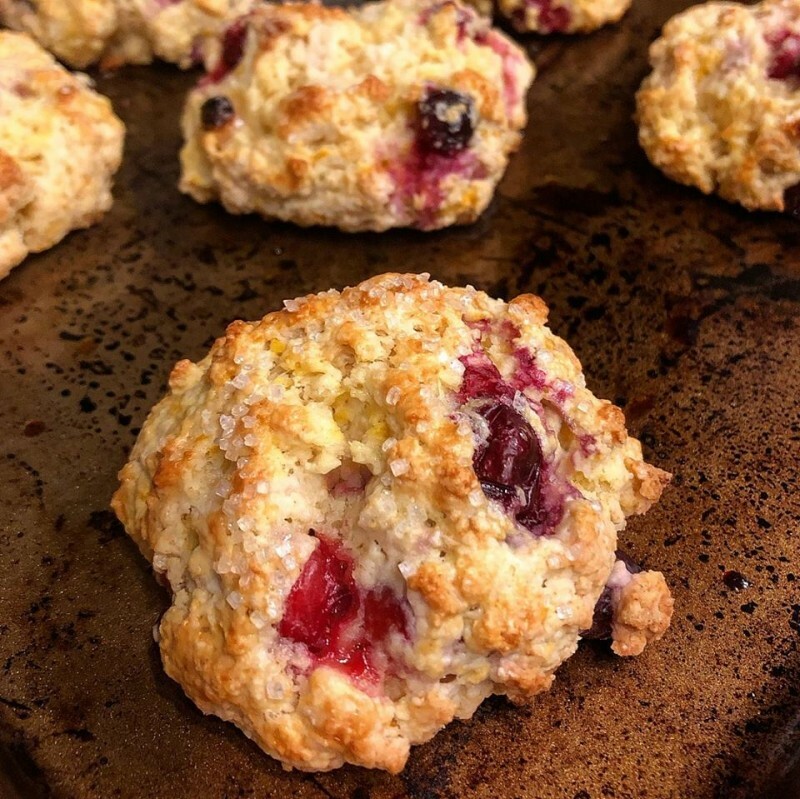 Also for the cranberry scones, I cut the cranberries in half so they'd integrate better and also added cinnamon and orange juice. I think both batches turned out great. Once they had cooled I wrapped them carefully and took them to FedEx to ship to my siblings. Hooray! By the time all that was done it was already pretty late in the day. I cleaned the house a bit and packed for the trip to my Aunt's next week. I chatted with Jameson during his layover, and worked on my Flat Stanley journal. Later tonight I'll go get Jameson from the airport, and we'll have two days together before I hit the road. I got a lot done this week...not as much as I wanted, but a lot. Hopefully it's enough.